14th March – Results by IAAF. 8th January – Info of 2nd Trial posted. 8th January – Photos of SAA Walks 1st Trial uploaded. 18th December – Event page created. Participants please register your interest for this meet by downloading this entry form and send it to SAA. The host covers board and lodging for 3 nights (9 – 12 March 2013) for maximum of 3 (one male athlete, one female athlete and one official) from each participating country. Participating Federations/Associations are responsible for travel to and from Japan and own medical insurance coverages. a) For Singapore Citizens only (Male/Female). c) Only 1 Male & 1 Female walker shall be in the final Team to NOMI. e) SAA will reimburse Athletes’ part of the air fare according to his/her results in NOMI. f) Any athlete who is disqualified (breaching the walking rules) during the trial shall not be selected. Report Card for Edmund Sim & Serene Seah at the Asian 20km Race Walking Championships 2012. 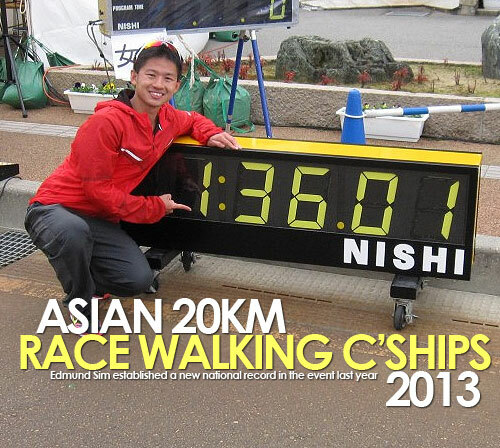 Race walker Edmund Sim breaks 20km road record in Japan. 2nd selection trial for Asian 20km Race Walking Championships 2012. Results of Selection Trial – Asian 20km Race Walking Championships 2012. Selection trial for Asian 20km Race Walking Championships 2012.